Backgroud: Walnut appears as the Signature of the Head and the kernel looks alike as the brain. It is a traditional belief that Walnuts may be beneficial to the brain. Objective: In the light of this traditional belief, the present study was conducted to confirm the effects of Juglan regia (Walnut) on cognitive functions of mice. Method: Two doses (500, 1000 mg/kg) of Walnut kernel powder were administered along with diet for fourteen successive days to Swiss young and aged mice. 29 groups of 145 Swiss young mice and 13 groups of 65 aged mice were employed in the present study. Exteroceptive behavioral models used in the present study were elevated plus maze and passive avoidance apparatus. 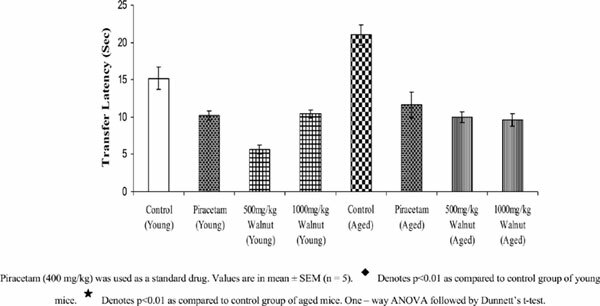 Results: Decreased TL and increased SDL values were indicative of a significant improvement in the memory of young and aged mice after Walnut powder administration. It also reversed the memory deficits induced by scopolamine and diazepam. In addition, the brain cholinesterase activity in young and aged mice was significantly inhibited by Walnut at the dose of 500 mg/kg. Walnut also showed a notable reduction in total cholesterol levels to the limit of 20% in young and 14% in aged mice at the dose of 500 mg/kg. Enhanced acetylcholine levels resulting from diminished AChE activity and hypocholesterolemia produced by Walnut appear to be the underlying mechanism for the improved memory of mice. Walnut, Akhrot, Juglan regia, hypocholesterolemia, cognitive functions, brain cholinesterase.